Are Rollercoasters a Health Risk for Adults and Seniors? 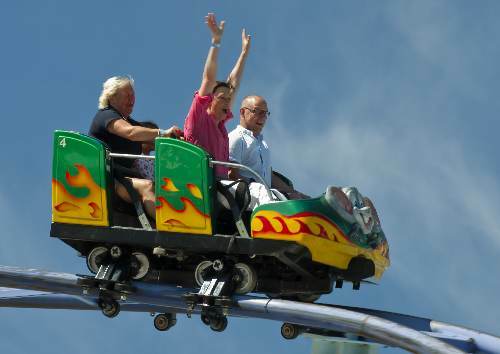 Home » General Health » Are Rollercoasters a Health Risk for Adults and Seniors? My dad called me last night in a full-on freak-out. This weekend his grandchildren are coming to visit and, like millions of kids around the world, they want to go to an amusement park to ride all the rollercoasters. But is he really? And are there any major health issues seniors should take into consideration when thinking about hopping on some rides at the amusement park this summer? Are rollercoasters a health risk at all? Are Rollercoasters Dangerous to Your Health? Surely you’ve heard the term young at heart…and there isn’t a better way of showing the world you’ve still got it than spending a day riding rollercoasters. But the truth is that although they are not inherently dangerous—there’s probably a higher risk of injury driving your car to the park—‘coasters might actually pose a risk to some older folks. If you’ve got high blood pressure or another heart condition, or perhaps issues with your neck or back, it might be a good idea to avoid the rollercoasters. These rides move jerkily and can toss people around quite a bit; in the process, they can exert a lot of stress on the body that’s not good for certain riders. At the end of the day, it’s really about what kind of condition you’re in. If you’ll be putting yourself in harm’s way because of an existing health condition like high blood pressure or heart disease or a physical ailment like a back or neck injury, it’s best to let the grandkids handle the ‘coasters while you sit and wait by the exit—in the shade. But if you’re in decent shape with good blood pressure and no existing health conditions, taking a spin on a couple of rollercoasters shouldn’t be a problem. The most important thing to know is that if you do have high blood pressure this year, you can work on it now so you might be able to take a ride with your grandkids next summer. You can lower your blood pressure by making more heart-healthy dietary choices and increasing overall activity. Remember: you’re aiming for whole, fresh foods and a healthy balance of a variety of items. It doesn’t take very long for your blood pressure to start dropping once the correct measures are taken, thereby greatly reducing your risk for heart attack. sometimes, age really is just a number. So if you’re not ready for a day at the amusement park with your grandkids this summer, aim to surprise them next year by getting your blood pressure in line!